The rise of “outsider” presidential candidates such as Donald Trump and Bernie Sanders has focused attention on the level of political frustration in the United States. By one measure – the share of Americans who express unfavorable opinions of both political parties – that frustration has grown. In our July survey, 24% of the public has an unfavorable opinion of both the Republican and Democratic parties. That is up from 19% in January, though little changed from yearly averages in polls conducted in 2014 and 2013 (22% each). The share expressing negative views of both parties has been higher in recent years than in the 2000s or 1990s. In the 2008 presidential election year, 12% viewed both parties unfavorably. In 2004, 10% did so, and in 2000, just 7% expressed unfavorable opinions of both the Republican and Democratic parties. Yet the rise in frustration with the parties, especially this year, is not the result of an across-the-board increase in negative views. Instead, it is largely concentrated among Republicans and Republican-leaning independents, who have become increasingly critical of the Republican Party. Currently, 36% of independents express unfavorable opinions of both parties, as do 22% of Republicans and just 9% of Democrats. The biggest shift in opinion has come among Republicans, whose unfavorable impression of both parties is more than double the percentage in January (9%). Democrats’ unfavorable view of the two parties is little changed from the start of the year (8%). Among independents, there has been a particularly stark rise in the unfavorable views of both parties among Republican-leaning independents, while there is little change in these views among Democratic leaners. Nearly half (47%) of Republican leaners have an unfavorable impression of both the Republican and Democratic parties, up from 32% in January and the highest percentage measured since 1992. Among Democratic-leaning independents, as among Democrats, there has been almost no change since January (22% today, 21% then). Republicans and Republican leaners continue to express overwhelmingly negative views of the Democratic Party, and these opinions have changed little since January. But their opinions about the Republican Party have soured – and, as a result, increasing shares of both Republicans and Republican leaners view both parties negatively. 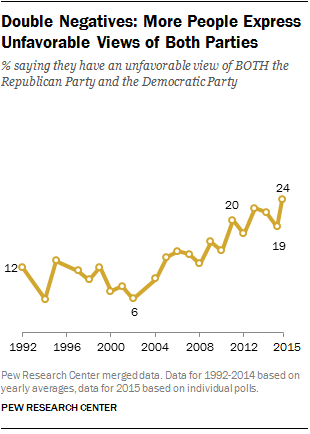 The share of Republicans who view the GOP unfavorably has more than doubled since January, from 12% to 27%. The change in opinions of the Republican Party among Republican leaners may be more striking. 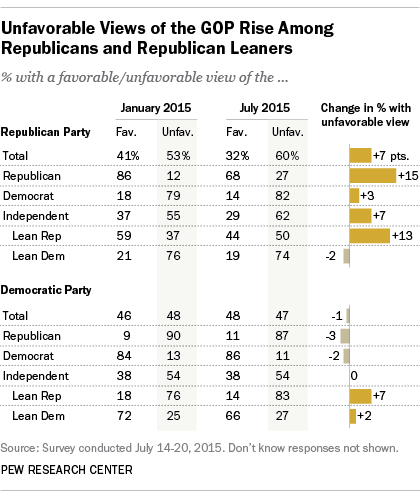 In January, 59% had a favorable impression of the party, while just 37% had an unfavorable view. Today, their opinions are divided: 44% have a favorable opinion of the Republican Party, while 50% express an unfavorable opinion. As we noted in our 2014 report on political polarization, people who lean toward the Republican and Democratic parties are similar ideologically to those who affiliate with a party and hold comparable positions on many key issues. However, those who lean toward a party tend to have a less positive view of that party than do actual partisans. This is particularly true for Republican leaners, who in recent years have consistently expressed more negative views of the GOP than Democratic leaners have of the Democratic Party. Today, about two-thirds (66%) of Democratic leaners view the Democratic Party favorably, while just 27% do not. But Republican leaners are far more critical of the GOP: Just 44% now say they have a favorable opinion of the GOP, while 50% view the party unfavorably.